This action is not just about style but it does affect the wine enjoyment. It consists on transferring the contents of a wine bottle into a decanter before serving. This action is not just about style but it does affect the wine enjoyment. Many persons will understand this as a fancy act to show off more around a table of friends. With my experience I can say that it very important to decant the wine, but need to know how doing it properly. When the wine is young, less than 10 years old, you may need to let it breath to fully appreciate it. Young and vigorous wine [Especially reds but can be done on some certain whites] will have a high acidity level, alcohol tones and astringency due to the tannins. In order to soften it, oxygen is need. It will enhance all other aromas and flavors, open them up to finally reveal a balance wine to your nose and palate. There are 2 different type of Decanter. One for young wine, those have a very large base and an open top. This is to maximize the oxygen contact. When you poor the wine, you want to increase the oxygen contact at its best. I would recommend shaking well the Decanter with the wine inside. You do that for a 10 to 15 second and leave it rest for a while. One for old wine, those are more in line shape, higher than wider with glass top. You just want to separate the wine from the sediment but you don’t want to have much oxygen interaction. To insure you do not transfer sediment from the bottle to the carafe, you will have a light source, like a candle, displays under the bottle neck but far enough to not heat the wine. This light source will allow you [by looking through the bottle neck] to see when the sediments appears then stop transferring. Using an old wine decanter for a young wine will only result a longer time needed to make it ready to enjoy. Using a young wine decanter with a old wine will result a too high oxygen contact. The wine will open too much and all aromas and flavors will be gone after 20 minutes. Your wine will become tastless. 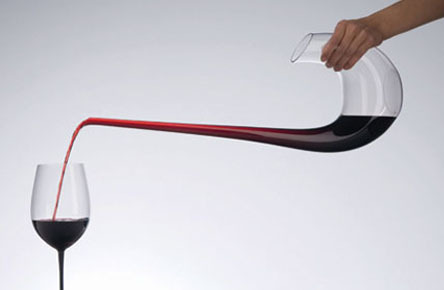 Last but not least, there are no price ranges for decanting. From Value for money to exclusive top end bottle of wine, the decanting process is here to make full enjoyment on the wine.